Borneo’s turtle island is a once in a lifetime experience. A chance to get up close and personal with some of this planets ancient creatures, in a sustainable and environmentally supportive way. Who doesn’t love turtles? Not loving turtles is like not loving puppies or kittens. They are amazing creatures who are simultaneously cute and awe-inspiring. While I was diving off the coast of Borneo on an island called Mabul, I didn’t go more than an hour in the water without seeing one. Actually, I also saw one from the deck of my accommodation as I watched the sunset. They are everywhere. 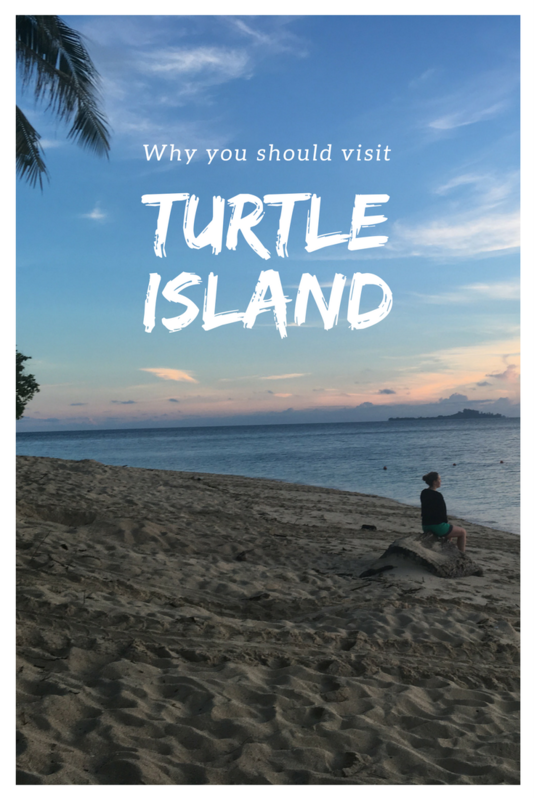 However, turtle island was by far the best “turtle experience”, not only did I get to see a mother turtle lay her eggs, but I got to see the hatchlings be released into the ocean. Magical! Turtle Island is part of marine conservation park between Malaysia and the Philippines, just off the coast of Sabah, Borneo. It is a great example of international cooperation for wildlife, being jointly managed by the two countries to preserve the turtle hatcheries. The best way to get there is through Sandakan, a seaside town, that is a launching pad to the island. How to get to Turtle Island? As turtle island is part of a highly protected marine park, there are only a limited number of visitors allowed on the island per day. Therefore, you cant just rock up or catch a boat there, you need to book a tour. There are a few tour companies that run a monopoly on the tours, however, their websites are a bit hard to navigate. I found the best way to book was to email them, they will then send you a secure booking link. 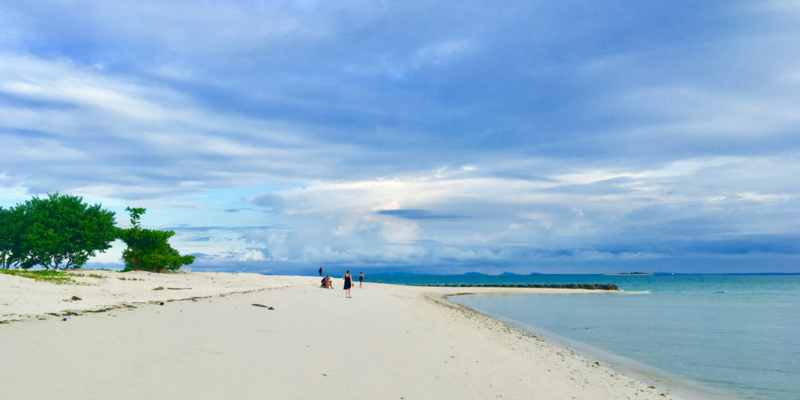 For more information on how to integrate Turtle Island into your itinerary, check out my Ultimate Sabah, Borneo Itinerary on a Budget post! How Does the Hatchery on Turtle Island Work? 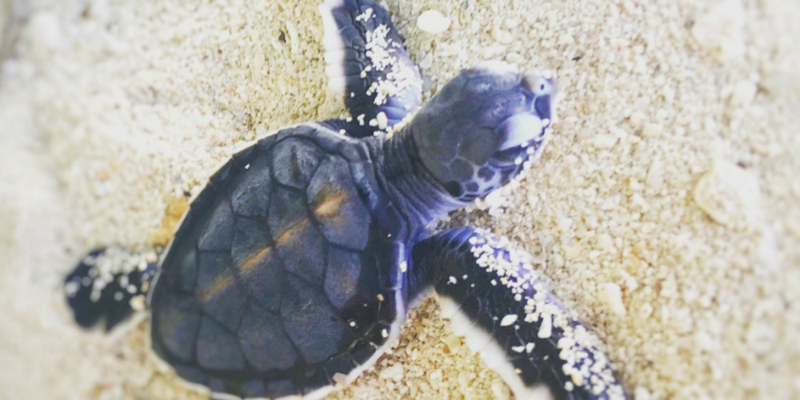 The island is a well-known nesting place for mother turtles, whose population is quickly dwindling due to the lack of safe nesting places, garbage in the sea and fishing nets. The marine park tries to offer a solution to at least one of those problems by offering a safe beach to nest. The marine wardens take the eggs out of the nest and place them in a hatchery. This is to protect the eggs from their natural predators which are lizards and birds, but also from other mother turtles who accidentally dig up nests while searching for a place to lay their own. As the island is highly protected there are no stray dogs or cats to threaten the nests. When the eggs are placed in the hatchery they are buried strategically as the temperature of the sand will affect whether the baby is a boy or girl. Once the eggs hatch the turtles climb up to the top but are trapped in a mesh cone until the wardens arrive and safely take them to the water. What will I Actually See on Turtle Island? Turtles! The wardens are quite strict about how you interact with the turtles, they try to limit the amount of exposure the wild animals have with humans – which from a conservation perspective is awesome. They do ensure that the tourists, who pay for the conservation, get an up-close encounter with the turtles. However, please keep in mind when you visit that it isn’t an amusement park, listen to instructions and treat the animals with respect. In the evening, after dinner, you will watch a short video about the turtle life cycle and the dangers it is facing. You will then sit around for an hour or so waiting for the wardens to call and tell you that a mother has come to lay. When I was there, they had 23 mothers come ashore to lay, but we were only allowed to see one. After you have seen a mother lay her eggs you are taken to the hatchery to see them gather up a group of babies who are now clamouring to get out of their mesh cone. The wardens take you and the babies, to the water’s edge so that you can see them scurry down the beach and into the water. I was extremely lucky while I was there. One nest of turtles got the timing wrong (they normally hatch at night) and came up mid-afternoon and had to be released. 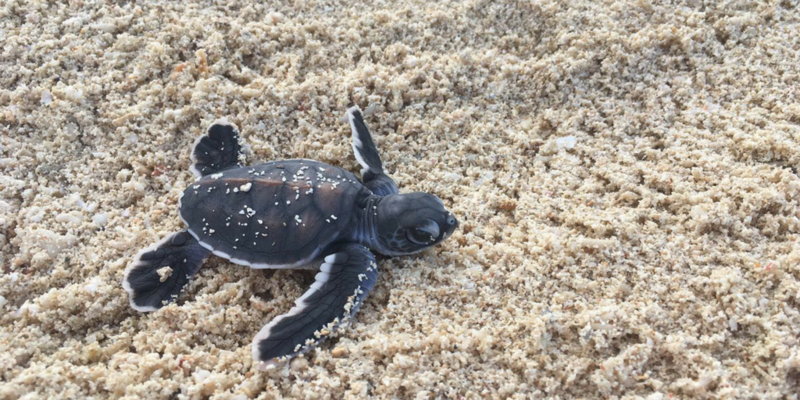 While I was sunbathing on the beach, a warden placed 20 little hatchlings right next to my head… I got to see them run for water, all the time making sure no birds got them. It was spectacular. The wardens later told me, that they only have a nest do that about once or twice a year! What Else is There to do on Turtle Island? First of all, it is a paradise island, so just being there feels amazing. There is also snorkelling and swimming and just general beach fun things. 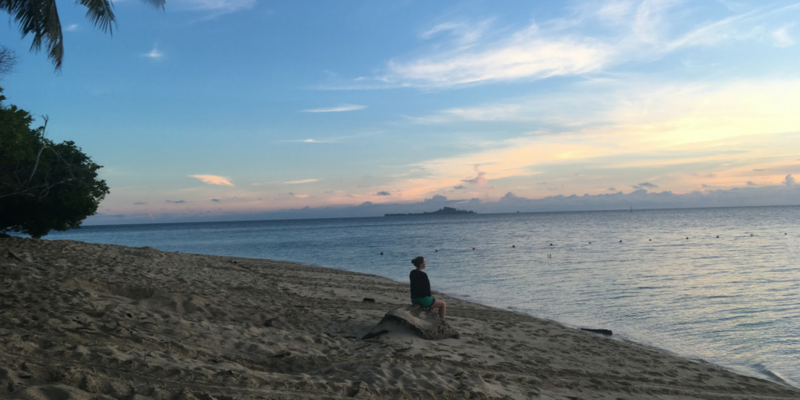 In the evening I walked around the island and watched the sunset – one of the most beautiful moments of my life. Where Will I Stay and What Will I Eat? All of your food is supplied as part of the tour, however, I would recommend bringing a few snacks for the afternoon chill out time. They don’t serve any alcohol so it isn’t a party island… more of a sleepy relaxing time. 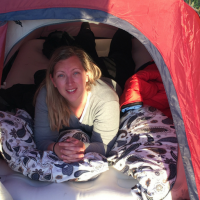 The cabins are beautiful, some of the best accommodation I have had on a budget. The rooms are air-conditioned as well! Feel free to email me if you have any questions or would like more information about my experience on Turtle Island. I can’t recommend it enough! I love stuff like this Helen! We visited a little hatchery and rehab center in Penang, Malyasia. I dig how more places are becoming hyper aware of our influence on nature, with conservation efforts improving around the world. These turtles can use some help! Or at least a willingness for us to live in harmony with these beautiful creatures, and with all of nature. I completely agree! And if my tourism dollars can help, then that’s great. What I loved about this place is we were limited to seeing only one nesting mother and one group of hatchlings. It wasn’t a free for all. I didn’t see the one in Penang – I guess that’s an excuse to go back there!